It’s time review round-up time again, in which I share my thoughts what I’ve been playing recently. 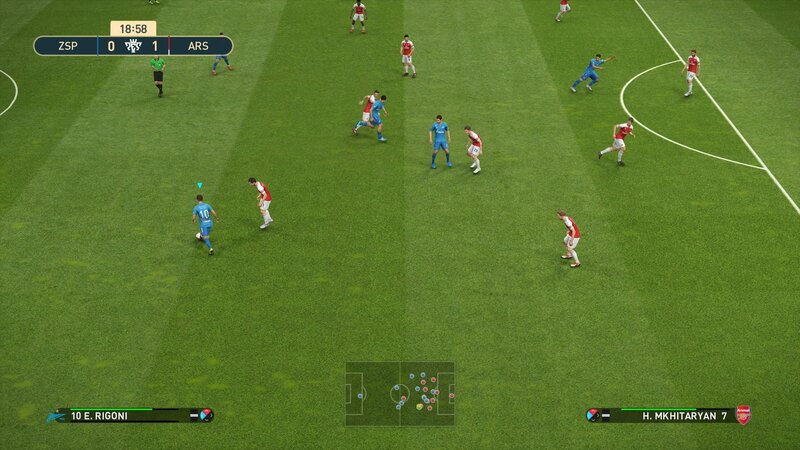 With EA’s FIFA finally getting back the Champions League licence it lost to PES a decade ago, Konami had to come up with some other way to keep punters’ interest. Its solution is a bunch of new licensed leagues, an area where PES has always been found seriously wanting. This team the Belgian, Norwegian, French, Dutch, Portuguese, Russian, Swiss, Turkish, Brazilian, Chilean and Argentinian leagues are fully licensed, as well as the mighty Scottish Premiership. As a Celtic supporter, this is a big deal for me: Celtic haven’t even been in a PES game since 2012, and now not only are they back as part of the licensed Scottish Premiership, they’re also a partner team, meaning their real player faces and stadium are included. That is, they will be. Frustratingly – presumably because it was a fairly last-minute deal – the Celtic player scans and Celtic Park aren’t in the game yet, and are due to be added as a free data pack some time in the future. While the wait continues for the game to be ‘complete’, then, the old faithful trio of Master League (the offline career mode), Become A Legend (where you play as a single player) and MyClub (the FIFA Ultimate Team equivalent) are still present and accounted for. Unfortunately, each is still overly confusing to navigate, with MyClub in particular needing a degree in electrical engineering to figure out how to put together a decent team. Stumble your way through this maze and find your way onto the pitch and things take a significant turn for the better: this is easily the best PES has been since the PS2 days. Passing is fluid, through balls have just the right weight, scoring is hugely satisfying and that ‘one more game’ syndrome is very much there, meaning many a late night is likely. It’s all rounded off with some truly gorgeous visuals: the arenas look incredible and the lighting is particularly impressive. The only thing letting the side down is the players who don’t have real faces (like most of the Celtic team at the time of writing), who look clearly less detailed and ‘uncanny valley’ than those who are accurately recreated. With FIFA 19 out in a matter of weeks it remains to be seen whether PES 2019 takes the football crown this year. Based on FIFA 18 I doubt it will, but the gap has closed significantly – especially on the pitch – and massive overhauls to the front end and MyClub structure could be all that’s needed next year to seal it entirely. It’s been seven years since THQ (RIP) and Blue Tongue Entertainment (RIP) brought De Blob 2 to the Wii (RIP), PS3 (RIP) and Xbox 360 (RIP). Following a remaster earlier this year on Xbox One and PS4, it’s now made its way to the Switch, and it’s more or less business as usual. If you’re unfamiliar with it, the aim is to travel around the grey and miserable Chroma City and bring it back to life by painting it. You do this by collecting paint as de titular Blob, then flinging yourself off buildings and other various objects. 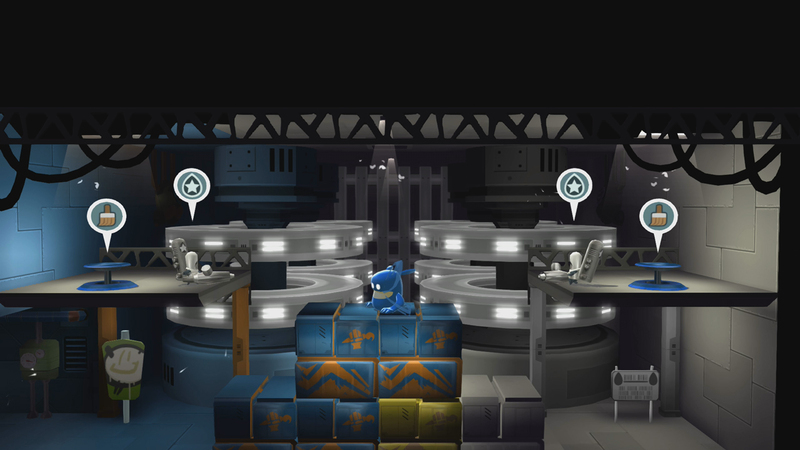 The result is a 3D platformer that packs in a fair share of varied missions, and is generally entertaining to play. The camera is a little flaky at times (though not as bad as the Switch port of the original De Blob, which was based on the Wii game), and the ‘HD’ visuals aren’t quite as sharp as I’d have liked. That said, if this one passed you by the first time around there’s enough here to paint a smile on your face regardless. When it comes to acquired tastes, there are few genres that appeal to such a niche market in the west as the first-person dungeon crawler. More popular among computer gamers in the ‘80s, every now and then you still get a modern attempt at breathing life into its ‘one step at a time’ mechanics. Haunted Dungeons: Hyakki Castle is the latest to step forward (then stop, then step forward again, then turn 90 degrees) and it isn’t bad. 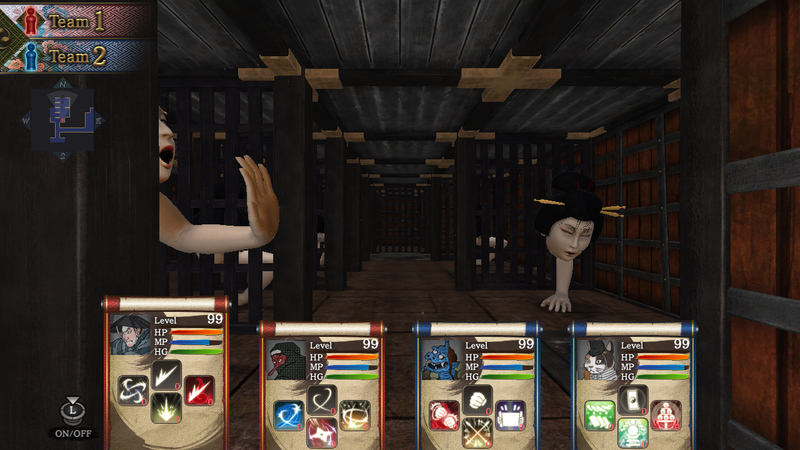 Rather than the usual orcs and skeletons you’d expect in games of this ilk, this time everything’s based on folklore and stories of the Edo period of Japanese history (1603-1868), meaning you’re taking on ‘yokai’ (Japanese monsters) instead. It’s also got a clever squad-splitting mechanic: at any point you can divide your four-person party into two groups, activating a split-screen effect. You then toggle between each group, allowing you to solve more complex puzzles, approach enemies from different angles and the like. That said, it’s still a first-person dungeon crawler when all is said and done, meaning no matter how much it’s been spruced up, it’ll still feel cumbersome and a little out of date if this genre isn’t your cup of tea. Here’s an interesting one: it’s a competitive one-on-one (or two-on-two) that mixes Street Fighter, Pong and Indonesian culture. 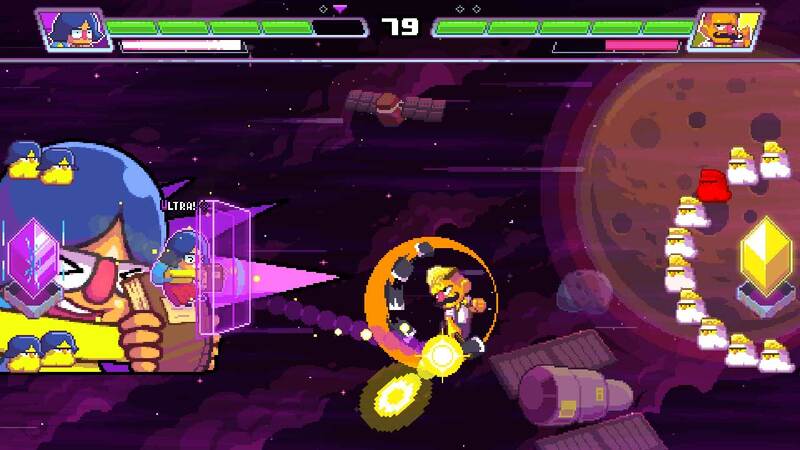 Developed by a studio based in Surabaya, Indonesia, Ultra Space Battle Brawl has you and your opponent(s) thwacking a ball back and forth, Pong style. Each player has a diamond sitting behind them that’s guarded by a number of shields. The aim is to knock the ball past your opponent and knock away their shields, exposing their diamond. Once you do that, every time you hit the diamond you’ll deplete their energy meter (Street Fighter style), until it eventually runs out and they’re KO’ed. Each stage has different diamond layouts and various other gimmicks, and each character has their own distinct ‘ultra’ move to give them the edge. I wasn’t sure what to expect here but I really like it. Single-player gameplay can be a little frustrating, because at times it feels like the CPU knows what your next move is going to be and it knocks back most of your shots with relative ease. Play it with one or three friends, though, and it’s fantastic fun, with plenty of swear words to be had. It’s also cool to play a game with a Southeast Asian flavour to it for once, meaning that even though it’s the typical ‘pixel art and chiptune music’ style 90% of indie games use these days, it still manages to feel unique. 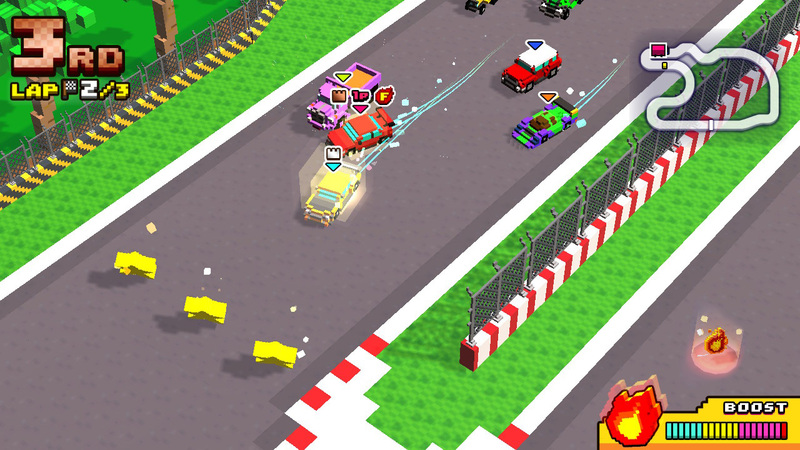 The Switch has its fair share of arcade-style top-down and isometric racers (I recommend Gotcha Racing 2nd and Mantis Burn Racing, for example), and here’s another. Chiki-Chiki Boxy Racers’ unique selling points are its boxy graphics and its multiplayer party games, and in each respect it succeeds to an extent. The colourful chunky art style is visually pleasant, though it’s disappointing that it doesn’t run at 60 frames per second despite its basic appearance. Its default control scheme is also awkward: you move the stick in the direction you want to steer, but given that each car has its own handling stats it leads to a feeling of disconnect when it naturally doesn’t immediately go where your stick is pointing. Thankfully, there’s an option to switch to a more traditional ‘left and right to steer’ option, and as soon as I enable that it was party time. Quite literally, as it turns out, because as well as the standard racing on offer – 12 tracks split across three Grands Prix – there are also four party mini-games to choose from. These involve playing car football (Rocket League doesn’t have much to worry about, though), collecting coins, painting the floor and smashing into boxes, and they can be played by up to eight players locally or online. Well, just locally: I tried to play online but there was never anyone around. If you’re looking to go solo then Chiki-Chiki Boxy Racers will entertain you but only for a short while: I rinsed all three GPs in an hour or two and the party games aren’t as fun against AI opponents. Should you be lucky enough to have regular multiplayer sessions, though, this is a nifty little contender to be introduced into your game rotation. Fair play to any game that tries to do something different with existing genres. Ninjin attempts just that by merging the beat ‘em up with the endless runner (sort of). 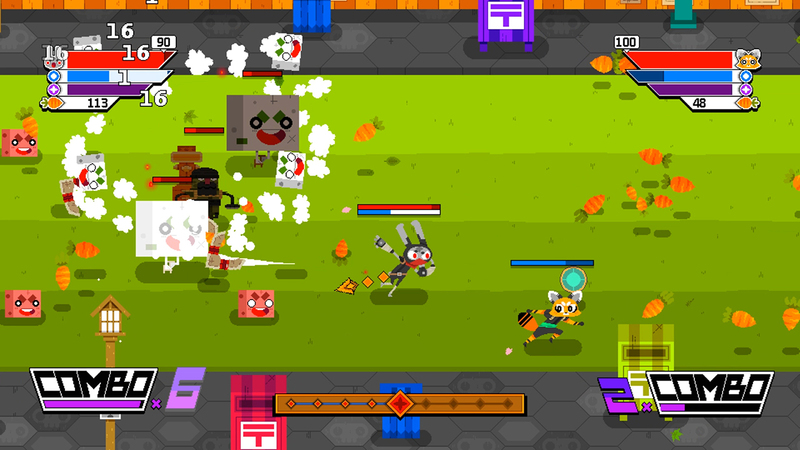 Playing as a rabbit called Ninjin (or a fox called Akai if you’d rather), the aim is to slash and shuriken your way through a bunch of stages as you try to get back your carrots from the evil Shogun Moe. Initially starting with a weak melee weapon and projectile, you can upgrade with the carrots you gain from fallen enemies, eventually building yourself into the ultimate ninja rabbit killing machine. There’s a point where things start to feel a little repetitive and you start getting the feeling that all you’re really doing is either dashing, slashing or… whatever rhymes with those but relates to throwing shurikens. It can also be a little frustrating at times, and often certain waves of enemies will boot your arse until you figure out how to deal with them (this is a game that encourages replaying stages numerous times). Its story, meanwhile, gets a little grating with jokey dialogue that often feels too try-hard. This can all be skipped, though, and isn’t necessary to play the game. These quibbles aside, though, for the most part it’s entertaining enough, especially in its co-op mode where both characters can team up to ninja the piss out of everyone. Review code for each game was provided by PRs, though I did also pre-order the Celtic edition of PES 2019 before receiving code.